Health | Asthma. Technology. Games. COPD, a disease of the lungs that obstructs regular breathing, is shown to be on the rise in the United States. Glaxosmithkline, (GSK) one of the worlds leading healthcare pharmaceutical companies, recently implemented a global survey for those living with COPD, the third leading cause of death. In the last decade, COPD has risen to affect approximately 6-7% of adults over the age of 40. It is beginning to affect more women and non-smokers than before. This could be a result of pollutants in the atmosphere but it is not for certain. COPD is a growing problem in the US and in one decade has risen from the fourth leading cause of death to the third, after heart disease and cancer. Data from the survey suggest that COPD prevalence has also increased from a decade ago, from six to seven percent of adults ages 40 years and older. The burden of COPD on patients and the US healthcare system was also high. Twenty-six percent of US participants reported visiting the emergency room as a result of their COPD, with an additional 17 percent hospitalized within the last year – a statistic similar to that reported in Mexico, and higher than those reported in most European countries surveyed. The survey also revealed that many patients may be underestimating the severity of their symptoms. While more than half (54 percent) of US participants reported clinically significant dyspnea (shortness of breath), the majority (70 percent) classified their COPD as only mild or moderate in severity, demonstrating a disconnect between the level of symptoms and their own subjective assessment of the disease. “Given GSK’s 40-year heritage in the respiratory disease area, we were keen to follow up on our decade-old landmark study—the first COPD cross-national, population-based survey of its kind—with an update that helps provide insights as to how the disease and its management have evolved over time,” said Kourtney Davis, PhD, MSPH, GSK’s lead global epidemiologist on the survey. In the US, the number of females affected by COPD (7.1 percent), was notably higher than males (6.2 percent). As a result, physicians may want to consider additional evaluation when women present with respiratory symptoms, recurrent respiratory infections, or fatigue, to assess COPD and improve outcomes. The percentage of US participants who were identified as “never-smokers” was 25 percent – giving researchers reason to explore additional risk factors, such as environmental or occupational exposures, and asthma, as well as consider whether symptomatic non-smoking patients need early screening and access to recommended disease management. Adherence to medication is the main method of prevention in chronic asthma cases. Asthma symptoms can be suppressed rather successfully with a consistent approach to medication usage. Neglecting to follow a medication regime is one of leading causes of hospitalization and even death for asthma sufferers. BBC published a recent study showing that almost one third of asthma patients in the U.K miss important hospital check-ups. This prevents doctors and healthcare professionals from being able to monitor their patients. Studies also show that a similar percentage of asthma patients in the U.S do not show up to their medical check-ups. More than a million people suffering from asthma are missing out on key yearly checks. New analysis by charity Asthma UK found that 31% of asthma patients did not receive an “essential” annual review to check whether they are on the right medicine. The charity said that its review of GP data for 2012/13 showed that there were 3,359,612 people in England who should have received an asthma review but 1,025,539 patients missed out. NHS guidance suggests that everyone with asthma should get an annual review, an asthma action plan and their inhaler technique checked. “With the worrying scale of prescribing errors identified by the National Review of Asthma Deaths, it’s vital that doctors and nurses do everything they can to follow up with patients to review their medicines, especially as asthma can vary hugely over the year. “There is also an unacceptably large variation in the numbers of people attending annual reviews, which ranges from only 52% to 79% across the UK,” a spokeswoman said. The Guardian recently covered two asthma studies regarding inhaler usage and growth in children. The studies were conducted by Francine Ducharme, a pediatrician at the University of Montreal. The first study analyzed published inhaler usage trials of over 8,400 children. Results showed that the growth rate for children under 18 without steroid usage exceeded the growth rate for children using steroids by approximately half a centimeter per year. The second study followed children who were taking medication doses between 50 to 200 micrograms of inhalable steroids. The children who took higher doses were at an increased risk of stunted growth. Children who use inhalable steroids for asthma grow slower than their peers in the first year of taking the medication, researchers say. But doctors said the effect was so small it was easily outweighed by the clear benefits of taking the drugs, which prevent serious asthma attacks and even deaths from the breathing disorder. 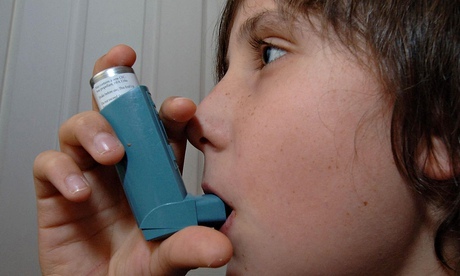 Children who used the common corticosteroids to alleviate their asthma symptoms grew on average half a centimetre less over the course of a year, compared with children who did not take the medicine. The steroids seemed to affect children’s growth only in the first year and had even less of an impact on their growth rate when used in low doses of no more than 100 micrograms. WebMDreports a new drug called quilizumab has the potential to treat mild asthma and allergy symptoms. The drug, targets blood cells that produce immunoglobulin type E (IgE), a protein that causes allergic reactions. In an initial study, the drug reduced total levels of IgE in patients suffering from mild asthma or allergic reactions. The levels of IgE were kept low for a month on the drug. Results also show that production of IgE was not only reduced but stopped in some cases. In early stages of testing, the drug only seems to be working with mild asthma and not with moderate to severe cases. Quilizumab is aiming to replace its rival, omalizumab, which requires one to three injections every two to four weeks. Quilizumab, on the other hand, only requires one inhalation approximately every three months. WEDNESDAY, July 2, 2014 (HealthDay News) — A new inhaled medication has the potential to treat mildasthma andallergies by interrupting the production of an immune system protein that triggers allergic reactions, a new study reports. The drug, quilizumab, targets the blood cells that produce a protein called immunoglobulin type E (IgE), that serves a key role in allergies. Quilizumab lowered total levels of IgE in theblood of people with allergies and mild asthma, and kept them low for a month, researchers report in the July 2 issue of the journal Science Translational Medicine. The University of Melbourne recently carried out a study testing the benefits of broccoli as it relates to asthma. Results showed that consuming one to two cups of steamed broccoli prevents asthma symptoms and potentially reverses lung damage. However, the benefits are not only limited to broccoli but are also found in other cruciferous vegetables. These vegetables alter the airway formation making it easier to breath. This study is among others that aim to discover the benefits of dietary changes for various illnesses and will be presented at the 2014 Undergraduate Research Conference in Shanghai. Broccoli could help asthma patients to breathe easy, a new study suggests. According to researchers at the University of Melbourne, eating one to two cups of lightly steamed broccoli could prevent asthma from worsening. Other vegetables belonging to the cruciferous family such as kale, cabbage, brussel sprouts, cauliflower and bok choy also help reverse lung damage, the study found. The Center for Disease Control conducts an annual survey to discover the self-reported U.S asthma rate. Results indicate a significant drop in asthma to a nine year low. 7.4% of the U.S population reported an asthma diagnoses compared to a fairly consistent rate at approximately 8.5% since 2009. The CDC is not completely convinced, having surveyed 47,000 people last year, and they are hesitant to declare its decline. Asthma is a chronic illness affecting around 3 million children and adults in the United States. One of the leading causes of asthma deaths is attributed to a lack of medication adherence. (Reuters) – Self-reported U.S. asthma rates have fallen significantly for the first time in four years to a nine-year low, according to a survey released on Thursday, but researchers cautioned that the numbers may not mean the disease is dwindling. About 7.4 percent of the U.S. population reported having asthma in 2013, down from a level that has hovered around 8.5 percent since 2009, the U.S. Centers for Disease Control and Prevention survey found.